This afternoon, the P.U.P. issued its own statement on what led to the request for a suspension. It says it is seriously concerned and appalled at the disingenuous actions of the Barrow administration to do anything possible to derail the Senate Hearings so that the truth about ministerial wrongdoings in the Immigration Department are not exposed to the Belizean people to see. The P.U.P. says that it became aware that U.D.P. operatives had organized thugs to instigate violence at the sitting of the Senate. 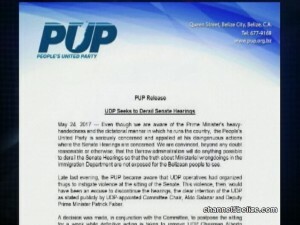 This violence, then, would have been an excuse to discontinue the hearings, as stated publicly by U.D.P.-appointed Committee Chair, Aldo Salazar and Deputy Prime Minister Patrick Faber. According to the P.U.P., a decision was made, in conjunction with the Committee, to postpone the sitting for a week while definitive action is taken to remove U.D.P. Chairman Alberto August, U.D.P. thugs and any threat of violence against anyone from the equation. While it was a difficult decision to make, the Party says it fully realizes that the U.D.P. will use any and every opportunity to disrupt the cross-examination of U.D.P. ministers. It is of the view that a postponement of one week is a small price to pay to allow for the hearings to continue until all is revealed. As a Party, and as Belizeans, the P.U.P. 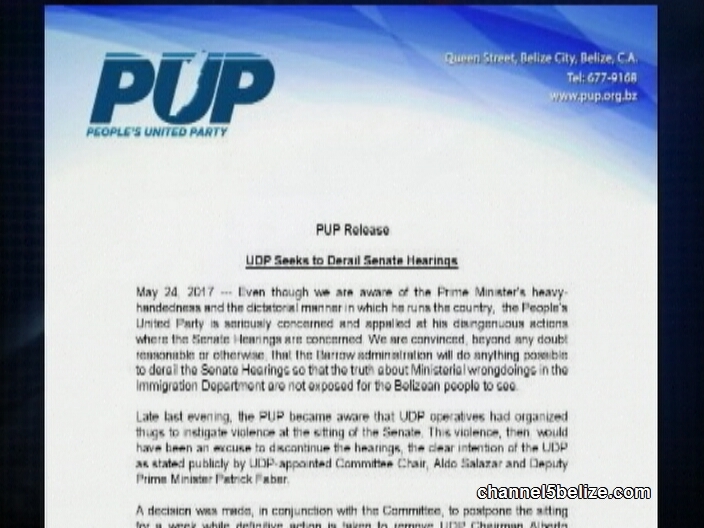 condemns the U.D.P.’s hijacking of the Senate hearing under threat of violence, and the Prime Minister for allowing, perhaps even condoning, the intent of violence against sitting senators. The release says, “We call him out for being patently disingenuous, since Alberto August and the other hired thugs work for him, and take instructions from him. By that token, the Prime Minister could have, with a word, called off his “dogs” and allowed the hearings to continue as demanded by the Belizean people.” It ends by calling on the police department to install all necessary security measures.